Bummed that you’re not strolling the canals of Venice right now for the Italian Mardi Gras celebration known as Carnevale? Celebrate in absentia with contributor Lara O’Brien and her tale of the (surprising) best meal ever. I never thought that I would be able to pinpoint one meal that truly stood out as the best of my life. But this summer I was proven wrong. If you had told me that the likelihood that this meal would happen in Italy—well, that I would believe hands down. That it would happen in Venice? Not so much. I’ve been to Venice many times. (The first time I was 11 years old and obsessed with feeding pigeons.) On every return visit, I’m amazed by its sheer beauty and spellbound by its art. I’ve attended the Biennale, Carnevale, spent hours wandering around the Jewish Ghetto, and spent nights drinking and dancing away in the bohemian bar Paradiso Perduto. I have incredible memories of each visit; however, not a single one involves food. For me, Venice is a hard town to eat in. Ridiculously touristy and expensive, a good meal is often hard to find. Too often one can end up trapped and/or bullied into overpriced restaurants with mediocre—hell, downright bad—food. And this is a shame, since Venetian cuisine is teeming with amazing seafood, baccala, risottos, and game. These people can cook and cook well; they just don’t always want to share. On this trip, I was determined to overcome this culinary conundrum. The ever-helpful Chowhound pointed me in the right direction with a list of tried-and-true restaurants approved by devout readers. Ristorante Riviera, on the Canale di Fusina in the not so touristy area of Dosodoro, sounded promising. With my good friend and traveling companion Ann-Louise, making her first visit to Venice, we took our seats at a table precariously close to the edge of the water and lifted flutes of Prosecco as the sun began to set. 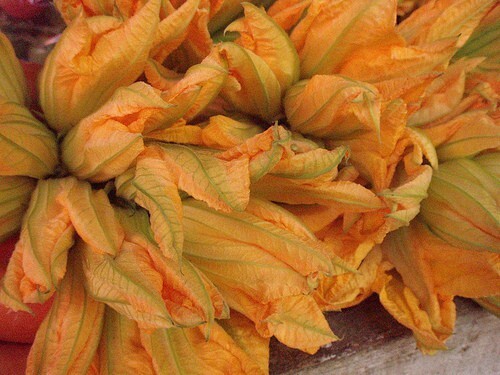 Looking across the canal to the island of Giudecca, we began with fresh zucchini flowers stuffed with ricotta, lightly fried and served with fennel and tomato salad. True, this is not a unique dish in Italy, but it’s hard to do it right. The batter has to be minimal, the oil fresh and the temperature just right (the further we traveled south, the more this was a problem). The end result was pitch perfect. The flowers were crispy on the outside, with warm but not melting ricotta on the inside, and all complemented by sweet grape tomatoes and fresh, sharp fennel. Next came what I consider the quintessential Venetian dish: spaghetti al nero di seppia, spaghetti with squid and squid ink. The dish was inky black, the pasta perfectly al dente and the squid beyond tender. Now two for two and well into a bottle of amazing local white wine, the atmosphere was made only more perfect by a busking classical flautist (only in Italy). Our last course was sesame-crusted tuna caught earlier that day. Dense, tender and a perfect med-rare, the dish shone with sheer simplicity. Flush with espresso and grappa, basking in seamless but not stuffy service and a perfect sunset, I sighed content with the knowledge that this truly was the best meal I ever had. Ristorante Riviera, Dorsoduro 1473, Venezia. +39 041 5227621.